Children in the gumnuts are beginning to learn about themselves and are becoming aware of the world and people around them. One of the most important aspects is to create partnerships with the families to gain their trust and so maximise the wellbeing of the children. Babies learn through their senses and will spend much of the day exploring – feeling different textures, hearing sounds, smelling and tasting new things for the very first time. The room is divided into indoor and outdoor experiences, cognitive, sensory, construction and relaxation areas. 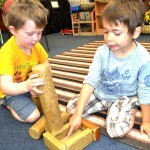 The children in the joeys room are curious and busy and they learn by experimenting. 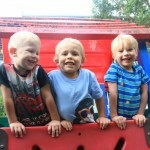 Toddlers are beginning to learn important life lessons such as friendship, learning to share and take turns. We aim to build individual skills as well as extend vocabulary, self-help and social skills, and build concentration to encourage the starting and finishing of activities. 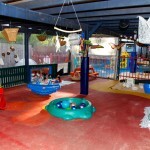 We provide the children with a safe and creative environment with plenty for them to explore. We place emphasis on the interests of the children and accommodate these interests in our daily routine and ensure they have a variety of choices. We work alongside our families to gain knowledge and understanding of their interests in their daily environment so we can incorporate these in our programming. We work on projects based on the children’s interests and these go on for as long as the interests last, linking to something else which becomes our next project. The group times and activities we provide aim to develop, nurture and extend the children’s social skills. The Children are becoming increasingly independent. They’re starting to use reasoning and problem solving skills. Strong friendships are made at childcare and a lot of fun is had when learning new skills and refining some of the skills already mastered. They are also developing their attention span and important skills for big school and beyond. Our school readiness program ensures the children are well prepared and confident when they move into their next phase of life. 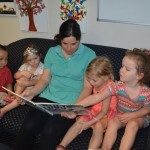 Our programs are created using guidelines from current research on early childhood development, advice from our governing bodies, the NSW Department of Education and Communities and the Australian Children’s Education and Care Quality Authority. We believe children are better understood and supported to learn and develop when using an holistic approach on their learning journey. This is why parents and families are encouraged to join in with their child’s learning by adding to portfolios, making suggestions, participating in surveys or talking with educators.